vidaXL is an international online retailer. "We offer a surprisingly large range of products consisting of thousands of articles from categories like home, garden, garage, DIY and clothing." vidaXL offers products for in and around the house at competitive prices, and want to make these products accessible to as many consumers as possible. For customer service inquiries or to initiate a return, please contact vidaXL at overstock@vidaxl.com or (855) 979-6686. You can initiate a return for new and unopened items within 30 days of delivery for a refund. To qualify for a refund, items must be in new and unused condition with all original materials and/or accessories. If a return is not received at our processing facility within 30 days, it may be subject to a partial refund. You will be responsible for return shipping costs. However, if the return is a result of a fulfillment error, product defect, or damage incurred during shipping, we will refund the full cost of the merchandise. We will provide a pre-paid return shipping label for Non-Buyer's Remorse and Buyer's Remorse returns. All returns are subject to inspection, and if found not to be an error on our part, the return shipping costs will be withheld from your refund. SPECIAL RETURNS INSTRUCTIONS: Once the seller approves the returns request, they will provide a Returns Merchandise Authorization. The Seller will issue a partial refund up to 100% for used or non-restockable items. This party tent is ideal for any outdoor events, such as shows, weddings, parties, barbecues. You can also install it in your backyard as a large, lovely sunshade retreat for your family and guests. The frame is made of heavy-duty painted steel which is rust-resistant and lightweight. The roof and the removable side panels are made of polyethylene tarp, which is water-repellent. It has zipped entrance for easy access. 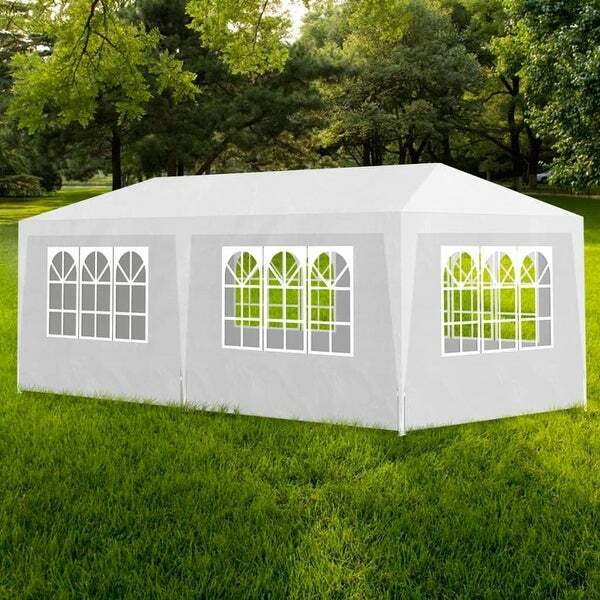 This party tent will guarantee you years of quality service. Installation is simple and no special tool is required. Delivery includes 1 party tent and installation accessories. Note: Please use a water-resistant spray to ensure the tent remains waterproof.